1. How did you get into the sport of cycling? Jordan: As most young lads do at a young age, I started playing football for a local team at the age of 7. After around three years of kicking a bag of air around a pitch for my local team in Wakefield, I wanted to try new things as I knew I was never going to be no footballer so started swimming which then lead onto triathlons. It soon came to my attention that swimming and running were my weaker points and that cycling was the only discipline where I was actually overtaking people during the race. So, I started racing my bike properly on the road at the age of around 13. My first race was at the Richard Dunn cycle circuit in 2012 which was part of the White Rose Youth League which I believe is still going strong now and has done for many years and has brought some of the best riders out of their shell from the Yorkshire region. I also attended the structured coaching sessions at the Richard Dunn as a youngster through the winter run by Ian O’Brien, Giles Pidcock and Mandy Parker. These sessions were definitely the sessions that made me realise how much I wanted to be a cyclist as you could measure yourself against the best in the region and track how well your winter training was going plus they were just a really enjoyable session to do. Since then I’ve been in love with the sport and have trained and raced hard to prove that I’ve got what it takes to be a professional cyclist. 2. Full time rider, student or working? Jordan: For the past year and a half I have been completing a full time level 3 business apprenticeship with Wakefield Council. It has been hard to balance training and work together but that’s when the great work of my coach Mike Wilson comes in (Better Cycling). During the winter months, it is mainly structured indoor sessions mixed with a bit of gym work and miles at the weekend. Mike manages my training perfect around my lifestyle and I have improved every year since I started being coached by him back in 2016. This year I was able to assist the team, ride as strong and stronger than some of the countries most respected riders whilst balancing this type of lifestyle and as a first year U23, so I’m really excited to see how I fair as a full time cyclist once my apprenticeship is finished in a few months’ time. 3. Best race for you in 2018 and why? Jordan: The Tour of Bihor in Romania was definitely my favourite race of the year. It was my first UCI race and also my form was coming along nicely around the time of the race. There was a brilliant selection of teams present at the race including Pro Continental team Androni Giocattoli. The team rode amazing through all three days and I feel this was the race that really brought the team together and the moral was sky high when we were riding alongside the big guns. 4. Best organised/fun race you did in 2018? Jordan: Otley Town Centre. I always look forward to this race every year as it’s always a cracking race with some really good crowds. In my opinion the best circuit race in the country but I’m not one for thousands of bends/corners in a 3km circuit so to me Otley is like a mini road race. 5. Toughest race of 2018 and why? Jordan: Tour of the Reservoir I’d probably say. It was my first year racing it this year. I’d watched it on tele from a young age and seen how brutal it was. Thankfully the weather was kind this year apart from the horrendous crosswinds on the first stage. But yeah that was such a tough race. There was less than half the field that actually got a final GC placement and I was fairly pleased that I was one of them rolling in, mid 30s. 7. Funniest moment in a race in 2018? Jordan: Tour of Bihor stage 4. Seeing an old lady cut straight across the front of the race on a mobility scooter was definitely something I wasn’t expecting to see at my first UCI race but it sure will be something that I will always remember. 8. Do you train alone or have others to help you get through the ride? 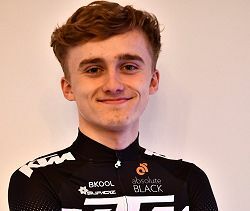 Jordan: I train mostly alone, but if I do need that extra motivation and a good kicking up the climbs, I usually ride with Mason Hollyman (Zappi) who lives up the road from me in Emley which is a good couple of hundred meters climbing in itself just to get to his house. So yeah, if I’m out with Mason, I’ll be counting the meters of climbing for the full ride. 9. In the winter – training on the road or indoors? Jordan: I do a lot indoors during the winter mostly due to the dark nights and work and then I get the miles in during the weekend. During the summer, I manage to get out every night for either some efforts or for some longer 3hr+ rides during the lighter nights. 10. How many hours on the bike can you fit in during an average winter training week? Jordan: Again it varies on the time of year but I manage around 10 to 12 during the winter and then 12+ during the summer months. 11. Is there any off the bike training (running/swimming/gym etc)? Jordan: Mostly do a bit of gym work in the winter months to build some leg strength and to try and gain more watts in my efforts. I also keep my core work up to scratch weekly. Jordan: I train with, heart rate, power but also feel too. I think it’s pretty important to listen to your body whilst training and racing. There’s only you that knows if something isn’t working/right or is working in training/racing so I do tend to listen to the body quite a lot as well as measuring performance with numbers. I ‘am a great believer in ‘If you feel good, you ride good’ because no matter what your numbers look like if you have high moral and some good sensations you will ride real good. 13. Which pieces of the clothing would you use to keep warm and dry on a rainy, cold day like winter now? Jordan: As much as possible. Whatever is in the draws, I’ll put it on or take it as spare and shove it underneath the jersey and swap it at the café if I’m so cold. Not a fan of this time of year. 14. What are your key goals for 2019? Jordan: My key goals next year will be to assist the team in the Premier Calendar races and UCI races whilst putting my experience that I gained this year into good use a gaining some really strong results. Overall I just want to be a strong asset to the team and carry on moving my way up the ranks. 15. If there was one race you could get a ride in during 2019, what would that be and why? Jordan: Definitely the Tour of Yorkshire and the Tour of Britain. The two biggest races which happen in England. I think for me the main one would be getting a ride in the Tour of Yorkshire if the team were to receive an invitation as it’s in my home county and in my opinion the best county across the country for riding your bike in. 16. Favourite pro race to watch on tele and why? Jordan: I really enjoy watching Milan San Remo just because of how unpredictable it can be from time to time. 17. Do you race in the winter to keep the top end or focus only on training? Jordan: I used to race a lot of cyclocross and track in the winter months but decided that I was never going to make a career in either of those disciplines so why bother. I specifically concentrate on training over the winter. 18. Finally, best thing about being in a UCI team for 2019? Jordan: The opportunities that are arising from being on the team. I was lucky enough to be on the team with Paul last year as he gave me lots of exposure, advice and experience which has progressed me as a rider. I’m really looking forward to getting stuck into my first race of 2019 with a new set up and with a really strong team. Hopefully 2019 will be even more successful as this year has been for my personal goals too.